Dr. Rafael Medoff is founding director of The David S. Wyman Institute for Holocaust Studies, and the author or editor of 18 books about Jewish history and the Holocaust. 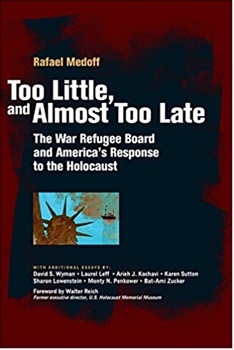 This essay is based on the research for his latest book, Too Little, and Almost Too Late: The War Refugee Board and America’s Response to the Holocaust. Refugee ships that were turned away from America’s shores. Railways to death camps that were never bombed. Rescue opportunities that were ignored. The painful story of the Roosevelt administration’s abandonment of Europe’s Jews during the Holocaust is by now well known. But there also is another side to this tragic history. It’s the little-known story of a handful of U.S. government officials who initiated extraordinary missions to rescue Jews from the Nazi genocide, despite the opposition or indifference of the White House, the State Department, and the War Department. A Jewish political action committee known as the Bergson Group tried to force Roosevelt’s hand. In late 1943, they sponsored full-page newspaper advertisements, lobbied on Capitol Hill, and organized a march by 400 rabbis to the White House, calling for creation of a U.S. government agency to rescue Jewish refugees. To avoid the rabbis, FDR slipped out of the White House through a rear exit. But congressional leaders did meet with them, and then introduced a resolution urging the president to establish a rescue agency. The administration sent senior State Department official Breckinridge Long to Capitol Hill to try to kill the resolution. That backfired when Long gave wildly misleading testimony about U.S. refugee policy, provoking widespread media coverage and denunciations from Jewish organizations and members of Congress. Meanwhile, behind the scenes, a handful of Treasury Department officials discovered that the State Department had been suppressing news about the mass murder of Europe’s Jews and sabotaging opportunities to rescue them. Armed with this information—and with the Senate poised to adopt the rescue resolution—Treasury Secretary Henry Morgenthau Jr. pleaded with the president to pre-empt Congress by creating the agency through an executive order. FDR did so. In January 1944, the War Refugee Board was born. In other words, President Roosevelt was against rescue before he was for it. In politics, some things never change, including the willingness of politicians to change their positions as convenience dictates. FDR gave the new board only token funding; 90 percent of its budget was supplied by private Jewish organizations. Moreover, the White House showed little interest in the board’s work, and the State Department and War Departments sometimes undermined its efforts. Fortunately, however, the same Treasury Department officials who had challenged the State Department became the senior staff of the War Refugee Board. John Pehle, Josiah D. DuBois, Jr. and their colleagues displayed a strong personal commitment that helped overcome many of the obstacles they encountered. During the final fifteen months of the war, the board energetically employed unorthodox means of rescue in Europe, including arranging for the sheltering of Jewish refugees by underground groups, the bribing of border officials, and the production of forged identification papers to protect refugees from the Nazis. Some of the board’s efforts were unsuccessful. Its pleas to President Roosevelt to grant temporary haven in the United States resulted in the admission of just one token group of 982 refugees. Requests to bomb Auschwitz or the railway lines leading to it were rejected by the administration. A plan for pressuring Spain to shelter more refugees was blocked by the U.S. ambassador in Madrid. But the board also saved the lives of 48,000 Rumanian Jews by moving them out of the path of the retreating German army. It engineered a series of threats that helped persuade the Hungarian authorities to (belatedly) end the deportations to Auschwitz. It arranged for the shipment of tens of thousands of food parcels to concentration camp inmates. And it convinced a young Swedish businessman, Raoul Wallenberg, to go to Nazi-occupied Budapest, where it financed his rescue of many thousands of Hungarian Jews. John Pehle, the board’s executive director, later described the agency’s efforts as “late and little." He was not mistaken. Yet at the same time, the War Refugee Board deserves credit for playing a major role in the rescue of more than 200,000 refugees. Considering the obstacles it faced and the woefully inadequate record of America’s response to the Holocaust overall, the War Refugee Board’s achievements were remarkable.